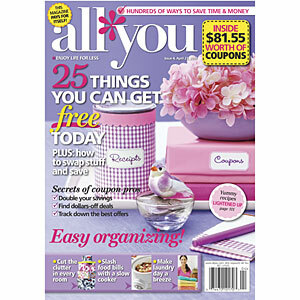 All You Magazine for Just $9.79 for a Year! March 4, 2011 · by Zack & Katie · Post may contain affiliate links. See my disclosure policy here. You have probably heard me mention All You Magazine before. This is a nice little home magazine that is filled with coupons. It is basically like getting an extra couple of coupon inserts along with a magazine! The coupons in the mag are sometimes exclusive to that magazine and have made for some nice freebies for myself and many other subscribers! This magazine is tough to find at a great price, but it's here now! Ebates is offering 51% cash back at magazines.com, so you just have to go to Ebates, and sign up or login. Then search for magazines.com and find All You from there. You will pay $19.97 for the subscription and will see the 51% cash back in your Ebates account in a couple of days. Even better, new Ebates users get a $5 sign up bonus for using this link, so they will pay just $4.97 for a full year!